NYC, 02/27/2019, 5:30PM. Italian author discusses her writing. 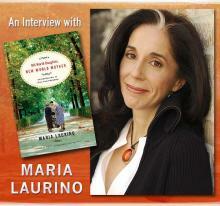 Join professor and author Maria Laurino as she discusses her writing. In her book, Were You Always Italian?, Maria Laurino sifts through the stereotypes bedeviling Italian Americans to deliver a penetrating and hilarious examination of third-generation ethnic identity. With "intelligence and honesty" (Arizona Republic), she writes about guidos, bimbettes, and mammoni (mama's boys in Italy); examines the clashing aesthetics of Giorgio Armani and Gianni Versace; and unravels the etymology of southern Italian dialect words like gavone and bubidabetz. Her second book is Old World Daughter, New World Mother: An Education in Love and Freedom. In the second-generation immigrant home where Maria Laurino grew up, “independent” was a dirty word and “sacrifice” was the ideal and reality of motherhood. But out in the world, Mary Tyler Moore was throwing her hat in the air, personifying the excitement and opportunities of the freedom loving American career woman. How, then, to reconcile one’s inner Livia Soprano—the archetypal ethnic mother—with a feminist icon? Combining lived experience with research and reporting on our contemporary work-family dilemmas, Laurino brews an unusual and affirming blend of contemporary and traditional values.